Patients who are registered with any of these practices can now access appointments from 6.30pm to 8pm on weekday evenings, as well as on Saturdays at the HADRIAN EXTRA CARE HUB based at Corbridge Health Centre. Appointments must be booked in advance through your own GP Practice. Any follow-up or onward management of your condition will be arranged by your own GP. Smear appointments available on Wednesday evening and the 1st Saturday of the month, contact us for more details and book these appointments based at Hadrian Extra Care Hub based at Corbridge Health Centre. HAVE YOU HAD YOU FLU VACCINE? The flu vaccine is offered free of charge on the NHS to people who are at risk. This is to help protect them against catching flu and developing serious complications. 3. have certain medical conditions patients with heart disease, diabetes, chest problems such as bronchitis and asthma, or long term kidney disease. If you are one of these patients it is important that you are protected against Influenza. It must be limited to what is necessary for the purposes for which it is processed. It can be retained for as long as is necessary for the reasons it was collected. Patients to have access to their own data. Patients can ask to have incorrect information changed. Restrict how their data is used. Move their patient data from one health organisation to another. The right to object to their patient information being processed (in certain circumstances). HADRIAN EXTRA CARE HUB – For patients who prefer to be seen in the evenings or on Saturdays a new service is being provided in collaboration with other local practices. 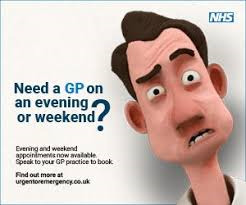 Appointments are available, between 6:30 and 8pm, Monday to Friday and from 9am to 5pm on Saturdays staffed by local GPs. If you would prefer to be seen during these times, appointments must be booked in advance – just ask our receptionist for an appointment in the Hadrian Extra Care Hub . If you need to cancel an appointment when our practice is closed please ring 01434 636950 and leave a message. From 1 April 2015 all patients at Prudhoe Medical Group, including children, will have a named GP who is responsible for their overall care at the practice. This does not, however, prevent you from seeing any GP in the practice as you currently do, and you are unlikely to see any notable change in the way care is delivered to you by our practice. "I am thrilled with the CQC assessment. I have been a GP at this practice since 1986 when Dr Donald Golightly was the senior partner. Sadly, Dr Golightly passed away just before Christmas. On the day after his death, we received the news from the CQC that we had achieved an 'outstanding' assessment. I would like to dedicate this assessment to his memory as it was the legacy of his high standards of patient care that inspired me. He was one of the early NHS GP pioneers who was always ready to embrace change, such as bringing the training of GPs to the practice, computerisation, and the development of team working, which are all taken for granted nowadays. We are blessed with a wonderful team of reception and administrative staff, nurses and doctors, with the support of an active patient participation group and the loyalty of our patients in the Prudhoe area." "Having worked and managed Prudhoe Medical Group for almost a year we have worked extremely hard to achieve the highest possible standards for our patients to provide effective and quality services. We have an excellent clinical and non-clinical team here at Prudhoe serving the Prudhoe patient population. A big thank you to all clinical, admin, all attached staff (District Nurses, Midwifes and Health Visiting Teams) and patient group members for all their contribution. We will look to continue to build and improve on services for our patients in the future." "There has been some some concerns expressed in the press recently about the CQC process but for our part we found it to be fair, rigorous and ultimately a positive experience for the whole team. We are fortunate to be a part of Tynedale where there has been a culture of quality and improvement within the local GP practices for many years. This outstanding result for us is the result of a lot of hard work and dedication by our staff and a healthy working relationship with our local teams and patient group. Our hope now is to build on this and continue to improve the service we offer to the patients of Prudhoe."